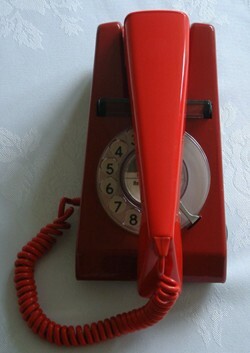 The red trimphone, or Phoenixphone, is regularly seen TV in modern programmes set in the seventies. I have seen one on 'Life on Mars', which was set in 1973, and recently on 'Margaret', a drama about Margaret Thatcher's final days in office. However, not in the heady days of the late 80s, but in a flashback scene from 1975 when she first challenged Ted Heath for the leadership of the Conservative Party. This two-tone red phone simply screams 70s, though it first went on sale in 1982. So the programme makers got it wrong. 'On sale' is the key point here. This garish version of the GPO's original pastel shaded statement of high-tech sophistication from the 60s was one of the first phones you could actually buy, rather than rent from BT as it was in 1982. The Trimphone was given a new makeover for the new decade. These new phones were available, not only in delightful two-tone red, but in olive green/beige, two-tone orange, black/grey, light green/mid green and cream/brown. Lord Snowdon, former husband of the late Princess Margaret, is said to have had a hand in picking the colours. Hence the range is also known as the Snowdon Collection. It may very well be that these phones were what the GPO should have been making in the 70s and the likelihood is that they were made from recycled parts from that era, but instead they spearheaded the brave new world of the yet to be privatised British Telecom. Two-tone red did not look too bad in the early 80s either, as toy box colours were in. The two-tone red phone looked great with bold diagonal striped wallpaper and black and white striped sofas. The first few years of the eighties were ultra modern. It was just the thing for the aspiring Yuppie, before the mobile phone came along. For more on the Phoenixphone see web.ukonline.co.uk/freshwater/t722.htm. "Trimphones in red were not available to customers until 1982. The GPO did experiment with different colours and did demo phones at exhibitions. It is possibly one of those. He does say that the phone dates from 1976, or maybe the site is wrong. "Hi I have purchased a Trim Phone in French Blue push button but looks like cant wall mount this any advice? Original Trimphones could be wall mounted with a kit, you will need to find one on eBay or at the Nataional Vintage Communications Fair (search for NVCF). If it is new Trimphone, I suggest you contact the seller and ask if it can be wall mounted.